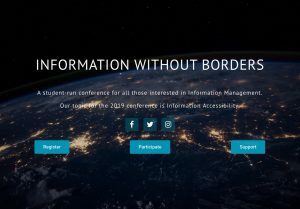 Registration for Information Without Borders 2019 Conference: Information Accessibility, February 12th is now open! To register, please follow this link. This year, Information Without Borders is exploring the theme of Information Accessibility at the lucky thirteenth annual student-led conference at Dalhousie University. The keynote speaker will be Dr. Teresa Blankmeyer Burke from Gallaudet University in Washington, D.C. She is the only signing deaf philosopher in the world with a doctorate in philosophy. Her publications cover a wide range of genres, including peer-reviewed scholarship in philosophy and bioethics, journalism, creative nonfiction, as well as poetry in American Sign Language and English. A panel of health librarians will discuss information access differences from consumers to clinicians, and solutions for libraries. We will hear from Bianca Mercer, a prison abolishment activist and first voice narrative expert, as well as Dr. Patti Doyle-Bedwell, an Aboriginal Women’s rights advocate and professor at Dalhousie University who will discuss Indigenous Knowledge. To cap things off, Daniel Rotsztain, Toronto’s urban geographer, writer and cartographer will be discussing how people can reinterpret everyday information in an urban environment. For more information about the speakers and updates visit iwbconference.ca and follow @iwbconference on social media. We invite you to join the conversation! What Are You Reading Now?